Quick question for you. What’s worse? Missing a workout or getting a bad night’s sleep? If you said missing a workout, then you’re missing the boat on what is actually responsible for getting those bigger biceps, more sculpted chest, powerful legs and ripped abs. HINT: It’s NOT the workout so much as it is the RECOVERY from that workout that does the trick! How Does Muscle Recovery Actually Work? One of the most confusing issues to gym goers is the fact that muscle growth actually happens a long way and many hours removed from the actual workout. Yes, the stimulus for growth is achieved during the 30-40 minutes you spent breaking down the muscle with set after set to failure and pushing yourself to all new accomplishments. However, the actual size increase can only happen if the muscle is allowed to repair itself from the micro-damage it incurred during that time in the gym. This happens best BY FAR when you’re counting your ZZZ’s instead of counting reps…in bed while sleeping. 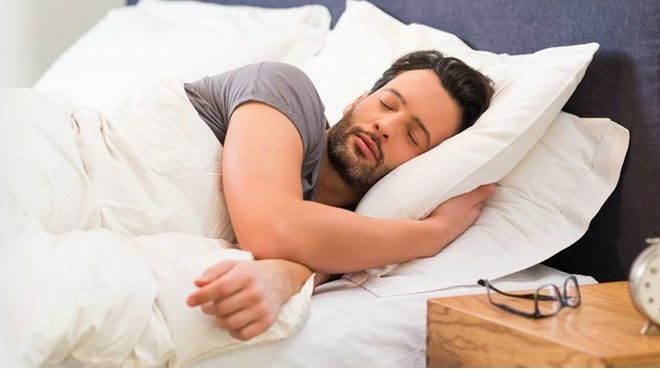 Through a combination of prime hormonal release (both human growth hormone and free testosterone production peak at night) and general physical recovery from day to day fatigue, night time sleep is by far the most anabolic time of the day for you. Far more than any workout could provide. So why is it that people tend to ignore and dismiss it’s importance? I can’t tell you how often I train athletes who think that sleep is overrated and try to operate on 3-5 hours a night. It’s actually not only killing their results, but long term, through it’s negative impacts on health as well….it might even be killing them! The reason why anabolic steroids have such powerful effects is due to one thing primarily….their ability to promote almost instant recovery. When somebody is abusing anabolic steroids, they can literally train a muscle group to within an inch of its proverbial life and then come right back the next day and do it all over again…at the same intensity! That would destroy a mortal man. Not so with the help of drugs. Now, seeing how that is NOT the route to go, what I do want you to see is that the major principle responsible for the extreme muscle growth is the ultra quick muscle repair. If someone can take steroids and train the same muscle group at high intensity 5 times a week with 100% recovery in between workouts and the non-drug user can only train it once every 9 days because of slowed repair and recovery (due to inadequate sleep, poor nutrition, etc) who do you think is going to grow faster and more? So how can we speed up that process. You got it…through good solid sleep. I recommend that you aim to get in between 6 and 9 hours of sleep a night. Realizing that your sleep cycles occur in 90 minute blocks (and that waking up mid-cycle can leave you one crabby S.O.B the following day) it’s best to either sleep 6 hours, 7.5 hours or 9 hours. Sometimes, oddly, it’s better to sleep 6 hours than it would be to sleep 8 simply because of the cycle disturbance. But that’s an argument for a entirely different time. For now, the bottom line is “get to bed already” will you! If you’re up reading this after 1 am and you need to be up at 6 am you have not only my permission to stop reading…but you’ve got my urging! You’re hopefully reading this to learn how to build muscle effectively and quickly. If so, believe me when I tell you that by continuing to read this if you should be sleeping…you’re costing yourself more than just precious zzz’s but also precious siZZZe in those muscles you’ve worked so hard on developing in the gym earlier today. P.S. To learn more about the exact amount of stimulus your muscles need to start the maximum growth process in action and the specific exercises that do it the best check out the AthLEAN-X Training System and see how workout efficiency trumps workout frequency every time.